It’s funny how life works. Chance encounters and people we met for entirely different reasons end up factoring into our lives in ways we couldn’t have possibly dreamed. As a writer, it’s often fun to trace the origins of your work because (let’s face it, Writers) our work always has something to do with us. Quite some time ago, I posted instructions of how to fold a paper crane and detailed how I learned it and who taught me. 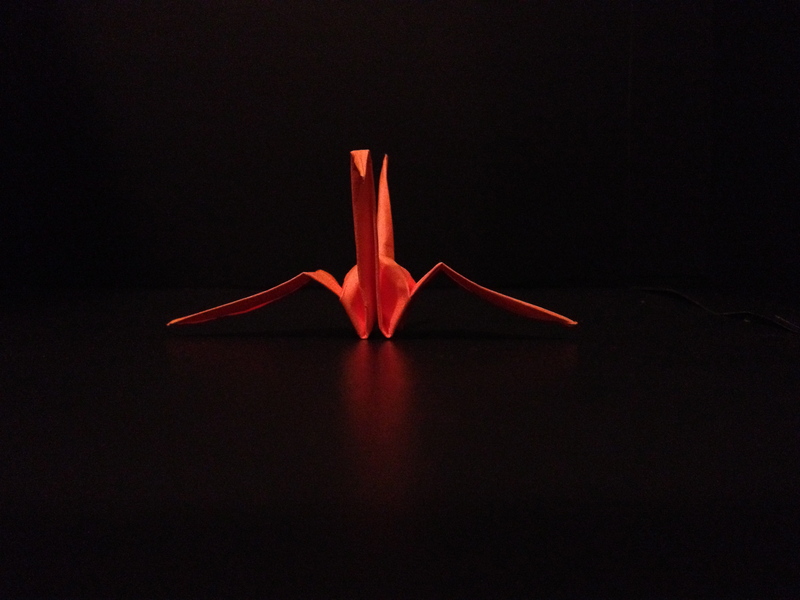 What I didn’t tell you then is that I loved the crane legend so much that I went on to fold 1,000 cranes and then, in good writer fashion, made up a story about it. Of course, the tutor who taught me to fold them inspired a character in that story, as did a couple other people in my life. In a very unfinished form, this story hung out in an obscure folder on two consecutive hard drives for many years. For some reason, I couldn’t quite complete it. So again in good writer fashion, I put it aside and practically forgot about it. In truth, I was trying to make the story something it wasn’t, but over the Christmas holiday in 2012, I decided to give it one more shot. The surprisingly quick result was a just-shy-of-20 page script that amazed me by how well it worked. Apparently, it wanted to be a short film all along. I was happy. Despite writing and directing a feature film while in grad school, this was the first script I’d written in I don’t know how long. But as it is with scripts, that wasn’t the end of it. Single crane for practical effects test. There are a select few who read my writing before I’m actually ready to do something with it. They know who they are. And while I certainly asked my normal group to read and comment, on a hunch, I also had a new reader respond to it. This reader was a film student and tutor (yes, one of mine when I ran a tutoring center) whose work I admired. That student was Dawson Burdick, who would later go on to a professional career as a media guru and owner of Gearbendr Studios. Turns out, not only does Dawson have impeccable narrative sense and intuition, he is also a magician. Whether on paper or within the computer, he can take blank space and breath life into it in ways that astonish me, even if it is just making clocks fly around. He is quite the artist and animator, and I am very proud to share one of his 3-D modeling experiments with you today. Give it a view. It’s worth it. I promise. I was honored to have such an homage dedicated to me. And now, I am so very happy that when I, some old film colleagues, and some new compatriots yet to be identified come together late this summer to finally bring that crane story to life, Dawson will be among them. It’s all coming together. Funny how that works out. 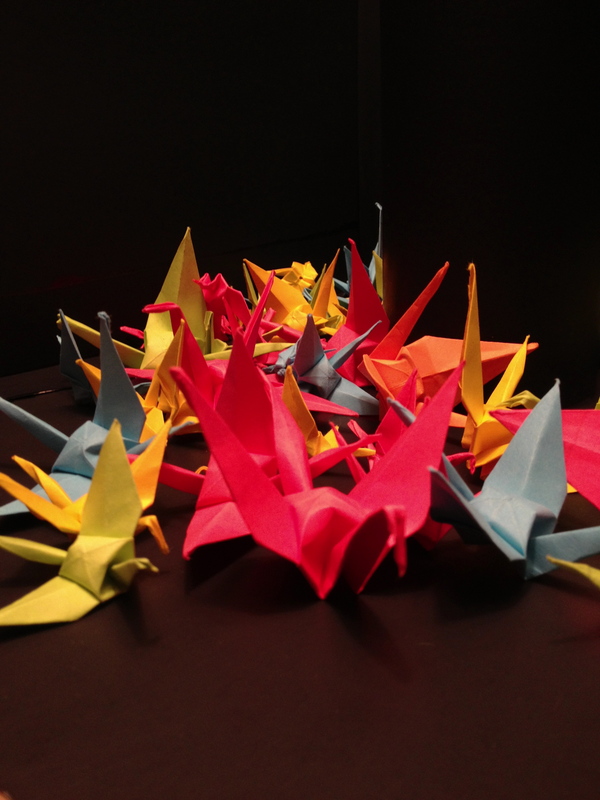 24 Responses to "What I Decided to Do With One Thousand Cranes"
Oh lord. All the folds. Cody Means liked this on Facebook. Hahaha! And there are so many more to do! Douglass Phoenix liked this on Facebook. Shyla M. Hairston liked this on Facebook. Andrew Tran liked this on Facebook. Nice song, (Thousand Cranes) composed by “Hiroshima” a tribute to Sadako Sasaki. Bret Terry liked this on Facebook. Vanelle Queen-of The-Universe liked this on Facebook. I made a thousand paper crane when I was younger and sick because of the story Sadako and the Thousand Paper Cranes and my mom still has them in a keep sake box. Sammy Json liked this on Facebook. I remember the cranes! Takes me back to undergrad days! Nice work! Niyati, I still have those tiny, tiny ones Tran made. They’re in a little glass jar on my bookcase. That’s awesome! those were really tiny too…he is a pro! The best 🙂 I’ve folded oh so many now, but I’m still not that good! Proud of You Kiddo!_)…Get It Folded Over and Done A Thousand Times Over! !_))…Then FLY With It……. Davis Osborne liked this on Facebook. Niyati Patel liked this on Facebook.